A number of periarticular disorders have become increasingly common over the past two to three decades, due in part to greater participation in recreational sports by individuals of a wide range of ages. Bursitis is inflammation of a bursa, which is a thin-walled sac lined with synovial tissue. The function of the bursa is to facilitate movement of tendons and muscles over bony prominences. Excessive frictional forces from overuse, trauma, systemic disease (e.g., rheumatoid arthritis, gout), or infection may cause bursitis. Subacromial bursitis (subdeltoid bursitis) is the most common form of bursitis. The subacromial bursa, which is contiguous with the subdeltoid bursa, is located between the undersurface of the acromion and the humeral head and is covered by the deltoid muscle. Bursitis is caused by repetitive overhead motion and often accompanies rotator cuff tendinitis. Another frequently encountered form is trochanteric bursitis, which involves the bursa around the insertion of the gluteus medius onto the greater trochanter of the femur. Patients experience pain over the lateral aspect of the hip and upper thigh and have tenderness over the posterior aspect of the greater trochanter. External rotation and resisted abduction of the hip elicit pain. Olecranon bursitis occurs over the posterior elbow, and when the area is acutely inflamed, infection or gout should be excluded by aspirating the bursa and performing a Gram stain and culture on the fluid as well as examining the fluid for urate crystals. Achilles bursitis involves the bursa located above the insertion of the tendon to the calcaneus and results from overuse and wearing tight shoes. Retrocalcaneal bursitis involves the bursa that is located between the calcaneus and posterior surface of the Achilles tendon. The pain is experienced at the back of the heel, and swelling appears on the medial and/or lateral side of the tendon. It occurs in association with spondyloarthropathies, rheumatoid arthritis, gout, or trauma. Ischial bursitis (weaver’s bottom) affects the bursa separating the gluteus medius from the ischial tuberosity and develops from prolonged sitting and pivoting on hard surfaces. Iliopsoas bursitis affects the bursa that lies between the iliopsoas muscle and hip joint and is lateral to the femoral vessels. Pain is experienced over this area and is made worse by hip extension and flexion. Anserine bursitis is an inflammation of the sartorius bursa located over the medial side of the tibia just below the knee and under the conjoint tendon and is manifested by pain on climbing stairs. Tenderness is present over the insertion of the conjoint tendon of the sartorius, gracilis, and semitendinosus. Prepatellar bursitis (housemaid’s knee) occurs in the bursa situated between the patella and overlying skin and is caused by kneeling on hard surfaces. Gout or infection may also occur at this site. Treatment of bursitis consists of prevention of the aggravating situation, rest of the involved part, administration of a nonsteroidal anti-inflammatory drug (NSAID) where appropriate for an individual patient, or local glucocorticoid injection. Tendinitis of the rotator cuff is the major cause of a painful shoulder and is currently thought to be caused by inflammation of the tendon(s). The rotator cuff consists of the tendons of the supraspinatus, infraspinatus, subscapularis, and teres minor muscles, and inserts on the humeral tuberosities. Of the tendons forming the rotator cuff, the supraspinatus tendon is the most often affected, probably because of its repeated impingement (impingement syndrome) between the humeral head and the undersurface of the anterior third of the acromion and coracoacromial ligament above, as well as the reduction in its blood supply that occurs with abduction of the arm (Fig. 23-1).The tendon of the infraspinatus and that of the long head of the biceps are less commonly involved. The process begins with edema and hemorrhage of the rotator cuff, which evolves to fibrotic thickening and eventually to rotator cuff degeneration with tendon tears and bone spurs. 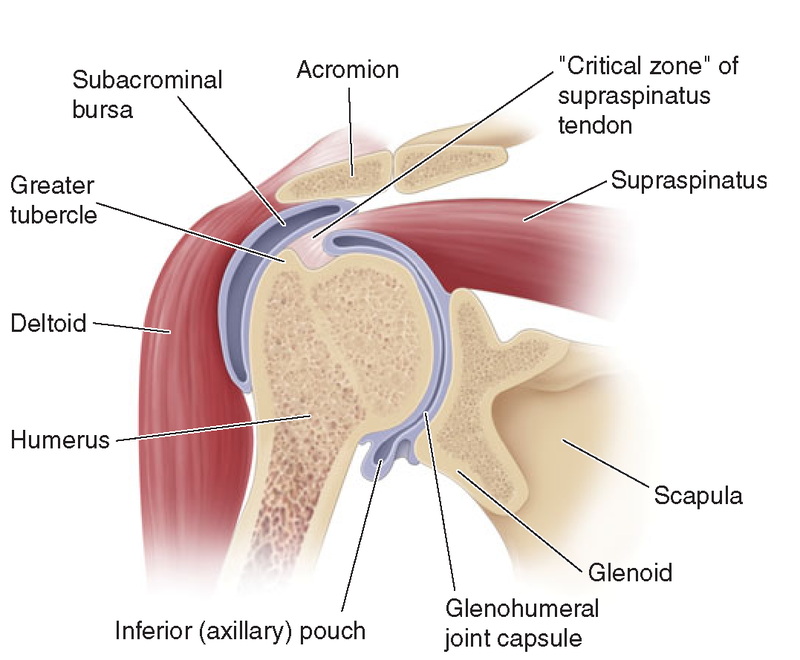 Coronal section of the shoulder illustrating the relationships of the glenohumeral joint, the joint capsule, the subacromial bursa, and the rotator cuff (supraspinatus tendon). Subacromial bursitis also accompanies this syndrome. Symptoms usually appear after injury or overuse, especially with activities involving elevation of the arm with some degree of forward flexion. Impingement syndrome occurs in persons participating in baseball, tennis, swimming, or occupations that require repeated elevation of the arm. Those over age 40 are particularly susceptible. Patients complain of a dull aching in the shoulder, which may interfere with sleep. Severe pain is experienced when the arm is actively abducted into an overhead position. The arc between 60° and 120° is especially painful.Tender-ness is present over the lateral aspect of the humeral head just below the acromion. NSAIDs, local glucocorticoid injection, and physical therapy may relieve symptoms. Surgical decompression of the subacromial space may be necessary in patients refractory to conservative treatment. Patients may tear the supraspinatus tendon acutely by falling on an outstretched arm or lifting a heavy object. Symptoms are pain along with weakness of abduction and external rotation of the shoulder. Atrophy of the supraspinatus muscles develops. The diagnosis is established by arthrogram, ultrasound, or MRI. Surgical repair may be necessary in patients who fail to respond to conservative measures. In patients with moderate to severe tears and functional loss, surgery is indicated. This condition is characterized by deposition of calcium salts, primarily hydroxyapatite, within a tendon. The exact mechanism of calcification is not known but may be initiated by ischemia or degeneration of the tendon. The supraspinatus tendon is most often affected because it is frequently impinged on and has a reduced blood supply when the arm is abducted. The condition usually develops after age 40. Calcification within the tendon may evoke acute inflammation, producing sudden and severe pain in the shoulder. However, it may be asymptomatic or not related to the patient’s symptoms. Bicipital tendinitis, or tenosynovitis, is produced by friction on the tendon of the long head of the biceps as it passes through the bicipital groove.When the inflammation is acute, patients experience anterior shoulder pain that radiates down the biceps into the forearm. Abduction and external rotation of the arm are painful and limited. The bicipital groove is very tender to palpation. Pain may be elicited along the course of the tendon by resisting supination of the forearm with the elbow at 90°(Yergason’s supination sign). Acute rupture of the tendon may occur with vigorous exercise of the arm and is often painful. In a young patient, it should be repaired surgically. Rupture of the tendon in an older person may be associated with little or no pain and is recognized by the presence of persistent swelling of the biceps (“Popeye” muscle) produced by the retraction of the long head of the biceps. Surgery is usually not necessary in this setting. In this condition, inflammation involves the abductor pollicis longus and the extensor pollicis brevis as these tendons pass through a fibrous sheath at the radial styloid process. The usual cause is repetitive twisting of the wrist. It may occur in pregnancy, and it also occurs in mothers who hold their babies with the thumb outstretched. Patients experience pain on grasping with their thumb, such as with pinching. Swelling and tenderness are often present over the radial styloid process. The Finkelstein sign is positive, which is elicited by having the patient place the thumb in the palm and close the fingers over it. The wrist is then ulnarly deviated, resulting in pain over the involved tendon sheath in the area of the radial styloid. Treatment consists initially of splinting the wrist and an NSAID. When severe or refractory to conservative treatment, glucocorticoid injections can be very effective. Tendinitis involves the patellar tendon at its attachment to the lower pole of the patella. Patients may experience pain when jumping during basketball or volleyball, going up stairs, or doing deep knee squats. Tenderness is noted on examination over the lower pole of the patella. Treatment consists of rest, icing, and NSAIDs, followed by strengthening and increasing flexibility. Often referred to as “frozen shoulder,” adhesive capsulitis is characterized by pain and restricted movement of the shoulder, usually in the absence of intrinsic shoulder disease. Night pain is often present in the affected shoulder. Adhesive capsulitis, however, may follow bursitis or tendinitis of the shoulder or be associated with systemic disorders such as chronic pulmonary disease, myocardial infarction, and diabetes mellitus. Prolonged immobility of the arm contributes to the development of adhesive capsulitis, and reflex sympathetic dystrophy is thought to be a pathogenic factor. The capsule of the shoulder is thickened, and a mild chronic inflammatory infiltrate and fibrosis may be present. Adhesive capsulitis occurs more commonly in women after age 50. Pain and stiffness usually develop gradually over several months to a year but progress rapidly in some patients. Pain may interfere with sleep. The shoulder is tender to palpation, and both active and passive movement is restricted. Radiographs of the shoulder show osteopenia. The diagnosis is confirmed by arthrography, in that only a limited amount of contrast material, usually <15 mL, can be injected under pressure into the shoulder joint. In most patients, the condition improves spontaneously 1-3 years after onset. While pain usually improves, most patients are left with some limitation of shoulder motion. Early mobilization of the arm following an injury to the shoulder may prevent the development of this disease. Slow but forceful injection of contrast material into the joint may lyse adhesions and stretch the capsule, resulting in improvement of shoulder motion. Manipulation under anesthesia may be helpful in some patients. Once the disease is established, therapy may have little effect on its natural course. Local injections of glucocorticoids, NSAIDs, and physical therapy may provide relief of symptoms. Lateral epicondylitis, or tennis elbow, is a painful condition involving the soft tissue over the lateral aspect of the elbow. The pain originates at or near the site of attachment of the common extensors to the lateral epi-condyle and may radiate into the forearm and dorsum of the wrist. This painful condition is thought to be caused by small tears of the extensor aponeurosis resulting from repeated resisted contractions of the extensor muscles. The pain usually appears after work or recreational activities involving repeated motions of wrist extension and supination against resistance. Most patients with this disorder injure themselves in activities other than tennis, such as pulling weeds, carrying suitcases or briefcases, or using a screwdriver. The injury in tennis usually occurs when hitting a backhand with the elbow flexed. Shaking hands and opening doors can reproduce the pain. Striking the lateral elbow against a solid object may also induce pain. The treatment is usually rest along with administration of an NSAID. Ultrasound, icing, and friction massage may also help relieve pain. When pain is severe, the elbow is placed in a sling or splinted at 90° of flexion. When the pain is acute and well localized, injection of a glucocorticoid using a small-gauge needle may be effective. Following injection, the patient should be advised to rest the arm for at least 1 month and avoid activities that would aggravate the elbow. Once symptoms have subsided, the patient should begin rehabilitation to strengthen and increase flexibility of the extensor muscles before resuming physical activity involving the arm. A forearm band placed 2.5-5.0 cm (1-2 in.) below the elbow may help to reduce tension on the extensor muscles at their attachment to the lateral epicondyle. The patient should be advised to restrict activities requiring forcible extension and supination of the wrist. Improvement may take several months. The patient may continue to experience mild pain but, with care, can usually avoid the return of debilitating pain. In an occasional patient, surgical release ofthe extensor aponeurosis may be necessary. Medial epicondylitis is an overuse syndrome resulting in pain over the medial side of the elbow with radiation into the forearm. The cause of this syndrome is considered to be repetitive resisted motions of wrist flexion and pronation, which lead to microtears and granulation tissue at the origin of the pronator teres and forearm flexors, particularly the flexor carpi radialis. This overuse syndrome is usually seen in patients >35 years and is much less common than lateral epicondylitis. It occurs most often in work-related repetitive activities but also occurs with recreational activities such as swinging a golf club (golfer’s elbow) or throwing a baseball. On physical examination, there is tenderness just distal to the medial epicondyle over the origin of the forearm flexors. Pain can be reproduced by resisting wrist flexion and pronation with the elbow extended. Radiographs are usually normal. The differential diagnosis of patients with medial elbow symptoms includes tears of the pronator teres, acute medial collateral ligament tear, and medial collateral ligament instability. Ulnar neuritis has been found in 25-50% of patients with medial epicondylitis and is associated with tenderness over the ulnar nerve at the elbow as well as hypesthesia and paresthesia on the ulnar side of the hand. The initial treatment of medial epicondylitis is conservative, involving rest, NSAIDs, friction massage, ultrasound, and icing. Some patients may require splinting. Injections of glucocorticoids at the painful site may also be effective. Patients should be instructed to rest at least 1 month. Also, patients should be started on physical therapy once the pain has subsided. In patients with chronic debilitating medial epicondylitis that remains unresponsive after at least a year of treatment, surgical release of the flexor muscle at its origin may be necessary and is often successful. Plantar fasciitis is a common cause of foot pain in adults, with the peak incidence occurring in people between the ages of 40 and 60 years. It is also seen more frequently in a younger population consisting of runners, aerobic exercise dancers, and ballet dancers. The pain originates at or near the site of the plantar fascia attachment to the medial tuberosity of the calcaneus. The plantar fascia is a thick fibrous band that extends distally, dividing into five slips that insert into each metatarsal head. Its function is to tighten and elevate the longitudinal arch as well as to invert the hind foot during the push-off phase of gait. Plantar fasciitis is thought to be the result of repetitive microtrauma to the tissue. Pathology of involved fascia reveals degeneration of fibrous tissue with or without fibroblast proliferation and chronic inflammation. Several factors that increase the risk of developing plantar fasciitis include obesity, pes planus (excessive pronation of the foot),pes cavus (high-arched foot), limited dorsiflexion of the ankle, prolonged standing, walking on hard surfaces, and faulty shoes. In runners, excessive running and a change to a harder running surface may precipitate plantar fasciitis. The diagnosis of plantar fasciitis can usually be made on the basis of history and physical examination alone. The onset of inferior heel pain of plantar fasciitis is typically gradual, but in some individuals it can be abrupt. Patients experience severe pain with the first steps on arising in the morning or following inactivity during the day. The pain usually lessens with weight-bearing activity during the day, only to worsen with continued activity. Pain is made worse on walking barefoot or up stairs. On examination, maximal tenderness is elicited on palpation over the inferior heel corresponding to the site of attachment of the plantar fascia. Imaging studies may be indicated when the diagnosis is not clear. Plain radiographs may show heel spurs, which are of little diagnostic significance as they may be present in patients with or without plantar fasciitis. A calcaneal stress fracture may be detected on plain radiographs; however, a bone scan is more sensitive. Bone scan in plantar fasciitis demonstrates increased uptake at the attachment of the plantar fascia to the calcaneus. Ultrasonography in plantar fasciitis can demonstrate thickening of the fascia and diffuse hypoechogenicity, indicating edema at the attachment of the plantar fascia to the calcaneus. MRI is a sensitive method for detecting plantar fasciitis, but it is usually not required for establishing the diagnosis. The differential diagnosis of inferior heel pain includes calcaneal stress fractures, the spondyloarthritides, rheumatoid arthritis, gout, neoplastic or infiltrative bone processes, and nerve compression/entrapment syndromes. The diagnosis of these disorders is made on clinical features, imaging studies, and laboratory findings, which distinguish them from plantar fasciitis. Long-term studies have found that resolution of symptoms occurs within 12 months in more than 80% of patients with plantar fasciitis. Treatment should begin immediately with the diagnosis of plantar fasciitis. The patient is advised to reduce or discontinue activities that can exacerbate plantar fasciitis. Initial treatment consists of ice, heat, massage, and stretching. Stretching of the plantar fascia and calf muscles are commonly employed and can be beneficial. Orthotics provide medial arch support and can be effective in relieving symptoms. Foot strapping or taping is commonly performed, and some patients may benefit by wearing a night splint designed to keep the ankle in a neutral position. A short course fasciotomy is reserved for those patients who have failed to improve after at least 6-12 months of conservative treatment.of NSAIDs can be given to alleviate symptoms in patients where the benefits outweigh the risks. Local glucocorticoid injections have also been shown to be efficacious but may carry an increased risk for plantar fascia rupture.